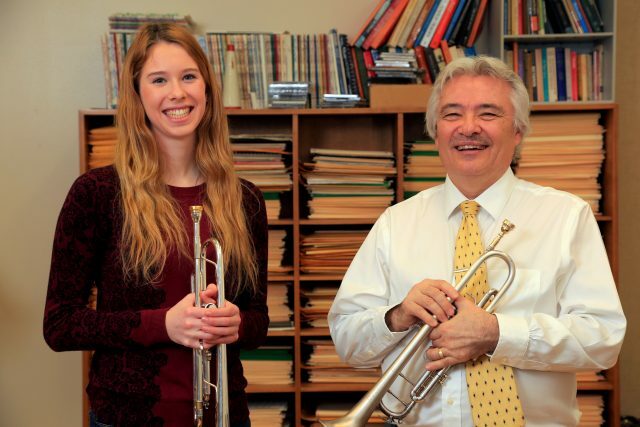 BRANDON – A Brandon University (BU) student has been named one of Canada’s best young musicians. Kayla Solomon was awarded first place in the brass category for her outstanding performance on trumpet at the prestigious 2017 National Music Festival earlier this month. Solomon, who last year placed third at the same event, was among 62 of Canada’s best young amateur musicians from across the country at this year’s competition, held from August 8–12 at the University of Ottawa. They competed and represented their provinces in eight different disciplines: piano, strings, voice, woodwinds, brass, classical guitar, chamber groups, and musical theatre. She says that the supportive culture at Brandon University has been instrumental to her success at the National Festival. “The professional atmosphere in the BU School of Music has encouraged and supported me throughout my development as a musician over the last three years. This support has provided me with opportunities to travel, to perform abroad, and to train and perform alongside professional musicians,” Solomon said. BU music professor Ed Bach, an instructor of Solomon’s who attended the festival, said that her performance was outstanding.